LCD Monitor Course II, which kicks off this session, will address certain points one must know to choose the LCD monitor best-suited to one's needs from the various models available. Part 1 will focus on color gamut. While wide color gamuts are the latest trend in LCD monitors, color gamut is a term that lends itself to misunderstanding. Our hope is that this session will help users better understand the color gamut of LCD monitors and better select, use, and adjust the products. 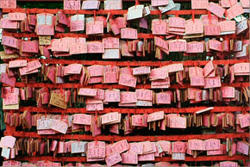 Just what is color gamut? A color gamut defines a more specific range of colors from the range of colors identifiable by the human eye (i.e., the visible spectrum). While color imaging devices include a wide range of devices, such as digital cameras, scanners, monitors, and printers, since the range of colors they can reproduce varies, the color gamut is established to make these differences clear and to reconcile the colors that can be used in common between devices. Various methods are used to express (diagram) the color gamut, but the common method used for display products is the xy chromaticity diagram of the XYZ color system established by the International Commission on Illumination (CIE). In an xy chromaticity diagram, the colors of the visible range are represented using numerical figures and graphed as color coordinates. In the following xy chromaticity diagram, the area shaped like an upside-down "U" surrounded by dotted lines indicates the range of colors visible to human beings with the naked eye. Various standards govern color gamuts. The three standards frequently cited in relation to personal computers are sRGB, Adobe RGB, and NTSC. The color gamut defined by each standard is depicted as a triangle on the xy chromaticity diagram. These triangles show the peak RGB coordinates connected by straight lines. A larger area inside a triangle is regarded to represent a standard capable of displaying more colors. For LCD monitors, this means that a product compatible with a color gamut associated with a larger triangle can reproduce a wider range of colors on screen. This is a CIE XYZ color system xy chromaticity diagram. The areas enclosed in dotted lines represent the range of colors human beings can see with the naked eye. The ranges corresponding to the sRGB, Adobe RGB, and NTSC standards defining color gamuts appear as triangles connecting their RGB peak coordinates. The color gamut of an LCD monitor's hardware can be indicated using similar triangles. An LCD monitor is not capable of reproduction (display) of colors outside its color gamut. The standard color gamut for personal computers is the international sRGB standard prepared in 1998 by the International Electrotechnical Commission (IEC). sRGB has established a firm position as the standard in Windows environments. In most cases, products like LCD monitors, printers, digital cameras, and various applications are configured to reproduce the sRGB color gamut as accurately as possible. By ensuring that the devices and applications used in the input and output of image data are sRGB compatible, we can reduce discrepancies in color between input and output. However, a look at the xy chromaticity diagram shows that the range of colors that can be expressed using sRGB is narrow. In particular, sRGB excludes the range of highly saturated colors. For this reason, as well as the fact that advances in devices such as digital cameras and printers have led to widespread use of devices capable of reproducing colors more vivid than those allowed under the sRGB standard, the Adobe RGB standard and its wider color gamut have recently drawn interest. Adobe RGB is characterized by a broader range than sRGB, particularly in the G domain—that is, by its ability to express more vivid greens. Adobe RGB was defined in 1998 by Adobe Systems, maker of the well-known Photoshop series of photo-retouching software products. While not an international standard like sRGB, it has become— backed by the high market share of Adobe's graphics applications—the de facto standard in professional color imaging environments and in the print and publishing industries. 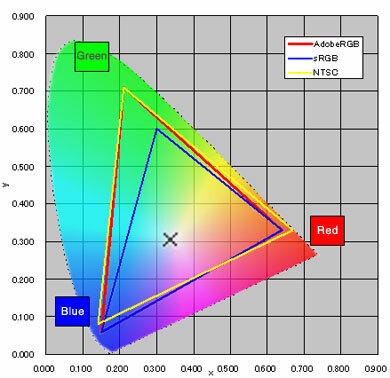 Growing numbers of LCD monitors can reproduce most of the Adobe RGB color gamut. NTSC, the color-gamut standard for analog television, is a color gamut developed by the National Television Standards Committee of the United States. While the range of colors that can be depicted under the NTSC standard is close to that of Adobe RGB, its R and B values differ slightly. The sRGB color gamut covers about 72% of the NTSC gamut. While monitors capable of reproducing the NTSC color gamut are required in places like video production sites, this is less important for individual users or for applications involving still images. sRGB compatibility and the capacity to reproduce the Adobe RGB color gamut are key points of LCD monitors that handle still images. 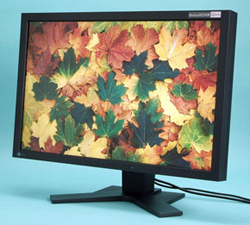 In general, the LCD monitors currently available for use with PCs have color gamuts capable of displaying nearly the entire sRGB gamut, thanks to the specifications for their LCD panels (and panel controls). However, given the rising demand mentioned above for reproducing color gamuts broader than sRGB, recent models have expanded the color gamuts of LCD monitors, with Adobe RGB serving as one target. But how is such expansion of LCD monitor color gamuts taking place? Improvements in backlights account for a significant proportion of the technologies expanding the color gamuts of LCD monitors. There are two major approaches to doing this: one involves expanding the color gamut of cold cathodes, the mainstream backlight technology; the other involves RGB LED backlights. On the subject of color-gamut expansion using cold cathodes, while strengthening the LCD panel's color filter is a quick fix, this also lowers screen luminance by decreasing light transmissivity. Increasing the luminance of the cold cathode to counter this effect tends to shorten the life of the device and often results in lighting irregularities. Efforts to date have overcome these drawbacks to a large extent; many LCD monitors feature cold cathodes with wide color gamuts resulting from modification of their phosphors. This generates cost benefits as well, since it makes it possible to expand the color gamut without major changes in the existing structure. Use of RGB LED backlights has increased relatively recently. These backlights make it possible to achieve higher levels of luminance and purity of color than cold cathodes. Despite certain disadvantages, including lower color stability (i.e., radiant-heat problems) than a cold cathode and difficulty in attaining a uniform white color across the entire screen, since it involves a mixture of RGB LEDs, these weaknesses have been resolved for the most part. RGB LED backlights cost more than cold-cathode backlights and are currently used in a fairly small proportion of LCD monitors. However, based on their efficacy in expanding color gamuts, the number of LCD monitors incorporating the technology will likely increase. This is also true for LCD televisions. In passing, many LCD monitors that extol wide color gamuts promote the area ratios of specific color gamuts (i.e., triangles on the xy chromaticity diagram). Many of us have probably have seen indications of attributes such as Adobe RGB rates and NTSC rates in product catalogs. However, these are only area ratios. Very few products include the entire Adobe RGB and NTSC color gamuts. Even if a monitor featured a 120% Adobe RGB ratio, it would remain impossible to determine the extent of the difference in RGB values between the LCD monitor's color gamut and the Adobe RGB color gamut. Since such statements lend themselves to misinterpretation, it is important to avoid being confused by product specifications. To eliminate problems involving labeled specifications, some manufacturers use the expression "coverage" in place of "area." Clearly, for example, an LCD monitor labeled as having Adobe RGB coverage of 95% can reproduce 95% of the Adobe RGB color gamut. From the user's perspective, coverage is a more user-friendly, easier-to-understand type of labeling than surface ratio. While switching all labeling to coverage presents difficulties, showing in xy chromaticity diagrams the color gamuts of LCD monitors to be used in color management will certainly make it easier for users to form their own judgments. With regard to the difference between area labeling and coverage labeling as gauges of an LCD monitor's color gamut, to use Adobe RGB as an example, in many cases, even a monitor with an Adobe RGB ratio of 100% in terms of area will feature coverage of less than 100 percent. Since coverage impacts practical use, one must avoid the mistake of seeing a higher figure as automatically better. When we check the color gamut of an LCD monitor, it's also important to remember that a wide color gamut is not necessarily equivalent to high image quality. This point may generate misunderstanding among many people. Color gamut is one spec used to measure the image quality of an LCD monitor, but color gamut alone does not determine image quality. The quality of the controls used to realize the full capabilities of an LCD panel having a wide color gamut is crucial. In essence, the capacity to generate accurate colors suited to one's own purposes outweighs a wide color gamut. When considering an LCD monitor with a wide color gamut, we need to determine if it has a color-gamut conversion function. Such functions control the LCD monitor's color gamut based on the target color gamut, such as Adobe RGB or sRGB. For example, by selecting sRGB mode from a menu option, we can adjust even an LCD monitor with a wide color gamut and high Adobe RGB coverage so that the colors displayed on screen fall within the sRGB color gamut. Few current LCD monitors offer color-gamut conversion functions (i.e., feature compatibility with both Adobe RGB and sRGB color gamuts). However, a color-gamut conversion function is essential for applications demanding accurate color generation in the Adobe RGB and sRGB color gamuts, such as photo retouching and Web production. For purposes requiring accurate color generation, an LCD color monitor lacking any color-gamut conversion function but having a wide color gamut can actually be a disadvantage in some cases. These LCD monitors display each RGB color mapped to the color gamut inherent to the LCD panel in eight bits at full color. As a result, the colors generated are often too vivid for displaying images in the sRGB color gamut (i.e., the sRGB color gamut cannot be reproduced accurately). 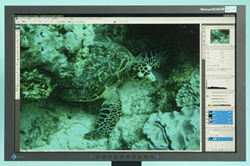 Shown here are examples of an sRGB color gamut photograph displayed on an sRGB-compatible LCD monitor (photo at left) and on an LCD monitor with a wide color gamut but incompatible with sRGB and with no color-gamut conversion function (photo at right). While the photograph at right appears vivid, saturation is unnaturally high in parts of the photo. We also see a significant departure from the colors envisioned by the photographer, as well as so-called memory colors. In more than a few cases, as expanding LCD monitor color gamuts result in the capacity to reproduce a wider range of colors and more opportunities to check colors or adjusting images on monitor screens, problems such as breakdowns in tonal gradations, variations in chromaticity caused by narrow viewing angles, and screen display irregularities, less conspicuous at color gamuts in the sRGB range, have become more pronounced. As mentioned earlier, the mere fact of incorporating an LCD panel with a wide color gamut does not ensure that an LCD monitor offers high image quality. On this subject, let's take a close look at various technologies for putting a wide color gamut to use. First we look at technologies to increase gradation. Key here is the internal gamma-correction function for multi-level gradation. This function displays eight-bit input signals on screen in each RGB color from the PC side after first subjecting them to multi-level gradation to 10 or more bits in each RGB color inside the LCD monitor, then assigning these to each RGB eight-bit color deemed optimal. This improves tonal gradations and gaps in hue by improving the gamma curve. 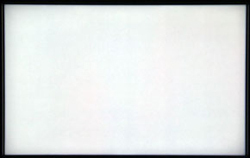 On the subject of the viewing angle of an LCD panel, while larger screen sizes generally make it easier to see differences, particularly with products with wide color gamuts, variations in chromaticity can be an issue. For the most part, chromaticity variation due to viewing angle is determined by the technology of the LCD panel, with superior ones showing no variation in color even when viewed from a moderate angle. Setting aside the various particulars of LCD panel technologies, these generally include in-plane switching (IPS), vertical alignment (VA), and twisted nematic (TN) panels, listed from smaller to larger chromaticity variation. While TN technology has advanced to the point at which viewing angle characteristics are much improved from several years back, a significant gap remains between this technology and VA and IPS technologies. If color performance and chromaticity variation are important, VA or IPS technology remains the better choice. A uniformity-correction function is a technology for reducing display irregularities. The uniformity referred to here refers to colors and brightness (luminance) on screen. An LCD monitor with superior uniformity has low levels of screen luminance irregularities or color irregularities. High-performance LCD monitors feature systems that measure luminance and chromaticity at each position on screen and correct them internally. This is a comparison of monitors with and without uniformity correction. An LCD monitor with uniformity correction (photo at left) has more uniform luminance and color on screen than one lacking uniformity correction (photo at right). The two photographs above have been adjusted to equalize levels to emphasize display irregularities. Actual irregularities would be less conspicuous. To make full use of an LCD monitor with a wide color gamut and to display colors as the user intended, one needs to consider adopting a calibration environment. LCD monitor calibration is a system for measuring colors on screen using a special-purpose calibrator and reflecting the characteristics of the colors in the ICC profile (a file defining device color characteristics) used by the operating system. Going through an ICC profile ensures uniformity between the color information handled by graphics software or other software and the colors generated by the LCD monitor to a high degree of precision. Software calibration refers to following the instructions of specialized calibration software to adjust parameters such as luminance, contrast, and color temperature (RGB balance) using the LCD monitor's adjustment menu, approaching the intended color through manual adjustments. Graphics driver colors are manipulated in some cases in place of the LCD monitor's adjustment menu. 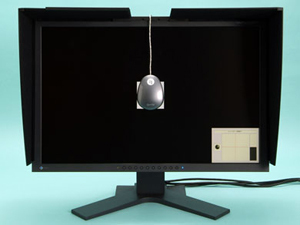 Software calibration features low cost and can be used to calibrate any LCD monitor. However, variations in precision can arise since software calibration involves manual adjustment. Internally, RGB gradation can suffer because display balance is matched by thinning RGB output levels using software processing. Even so, use of software calibration will likely make it easier to reproduce colors as intended than using no calibration at all. In contrast, hardware calibration is clearly more precise than software calibration. It also requires less effort, although it can be used only with compatible LCD monitors and entails certain setup costs. In general, it involves the following steps: calibration software controls the calibrator; matching color characteristics on screen with target color characteristics and directly adjusting the LCD monitor's luminance, contrast, and gamma-correction table (look-up table) at the hardware level. Another aspect of hardware calibration that cannot be overlooked is its ease of use. All tasks through the preparation of an ICC profile for the results of adjustment and registering this to the OS are done automatically. By combining a ColorEdge-series monitor with a calibrator and ColorNavigator special-purpose color-calibration software, one can achieve easy, precise hardware calibration. In the next session, we will examine LCD monitor interfaces and a number of video interfaces for LCD monitors, including the latest generation of interfaces such as HDMI and DisplayPort.